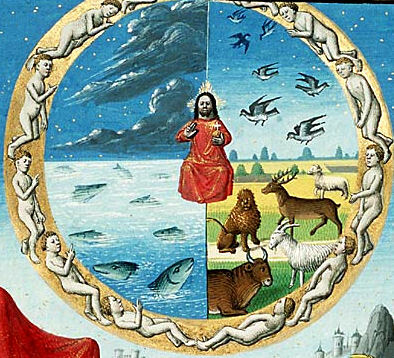 Dear readers, this week I am very pleased to present a continuation of the hurricane theme from last week by Thomas Decker, a German traditional astrologer whose skills I greatly respect. In the future, I plan to mix things up a bit, and publish articles by other traditional astrologers to give you a sense of the great variety within traditional astrology. If you are interested in having your article appear on this blog, contact me at nina “at” gryphonastrology.com. Enjoy! At the beginning of the hurricane season I asked a horary question whether there might be another devastating storm in the Gulf of Mexico region. The general tenor of the chart was yes and probably at the beginning of September. But this particular chart does not answer the question where this might be. Other methods are required. The first step is to try to find a focus of activity and so it seems that a rough triangulation would be the appropriate method. The Cancer Ingress chart for Cancún, Mexico, Santiago de Cuba and Miami Beach give a general region where most tropical storms and hurricanes seem to cross. This is really very rough, other points could also be used. The charts of Cancún and Miami show some indications of danger. In the Cancún Ingress chart the MC is at 9 degrees Aries which is one degree away from the position of the last total solar eclipse on March 29th. The Miami chart has Mercury and Procyon rising. More detail is required, however, as judgement cannot be made on an Ingress chart alone. The New Moon charts of August 23 and the Full Moon/lunar eclipse charts of September 7 need also to be considered. Here activity directly on the angles would support any testimony given by the Ingress chart. A cursory view shows some danger but nothing extreme. That doesn’t exclude storm activity. In the Cancún New Moon chart Mars is applying to conjunction with the MC, an indication of danger. In the lunar eclipse chart of Cancún Mars repeats this pattern, he is once again within one degree of the MC. This is like a multiplication. But based on the Cancún chart I tried to find an area where there is even more focused activity. There must be somewhere where Mars might be exactly on the MC. As the New Moon occurs only at 0 degrees Virgo, we have to look for somewhere a little bit further west and a bit more northward. And so I examined the charts of Houston, Texas. So let us look at these charts. 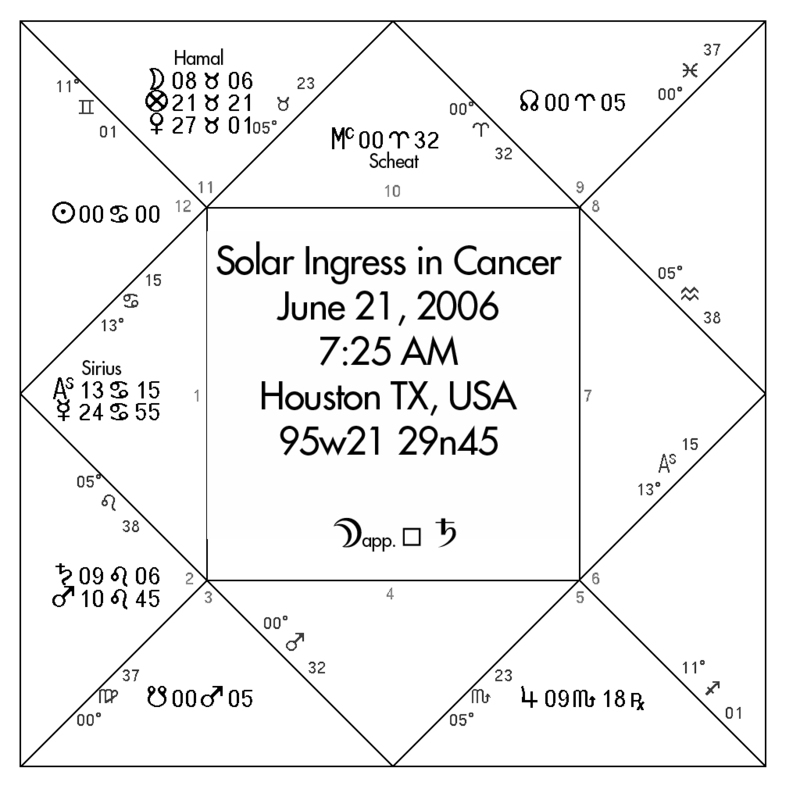 The Cancer Ingress chart of Houston has Sirius, the Dog-star rising. Sirius was important to the Egyptians as he marked the flooding of the Nile. The Nodes are directly on the MC/IC axis of the chart in exact square to the Sun in the 12th house. The North Node and the MC are conjunct Scheat a fixed star of the nature of Mars and Mercury. Scheat is associated with drowning. A conjunction with one of the nodes usually brings with it far reaching change in the sense of before and after. The North Node tends to multiply anything for better or worse. In combination with a malefic fixed star associated with drowning this does not portend well. Already all of the exact aspects and the tie in two fixed stars is testimony to look closer. While the Cancún charts are like warning lights, this chart is already like a siren. 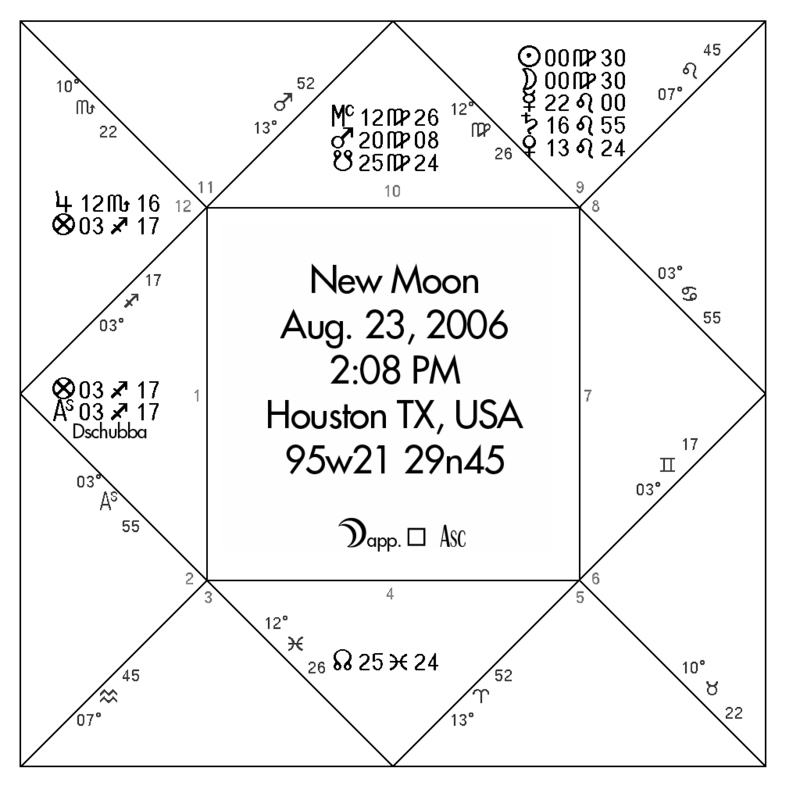 Let us continue with the New Moon chart for Houston. Mars at 20 degrees Virgo forms an exact sextile, in mundo, to the position of the Sun in the Cancer Ingress chart. This position of Mars we need to remember as it plays a central role in the Lunar eclipse chart. What we see here is an activation of the Ingress T- square of the Sun to the MC/IC and Lunar Nodes. As to timing, the one degree application of both Mars and Mercury to respective critical points would show that within a week of the eclipse a very dangerous storm will approach Houston and Galveston, Texas. If we were to try to formulate all of this in William Lilly’s language we might say: “Citizens of Houston take warning. The month of September may be one of many troubles from storms, flooding and general malevolence of the elements” It certainly wouldn’t hurt to take the necessary precautions. The hurricane season is the theme here. Everyone knows that through global warming hurricanes will increase both in number and intensity. No one knows where and when. Just as meteorological methods of prediction are used to try to narrow down this area of the unknown it seems justifiable to use the time honoured astrological approach particularly if extra precautions, such as the strengthening of storm protections can be taken in time, and anyone in authority can thereby be convinced that this is indeed necessary. The astrological testimonies mentioned above are so strong that it is a responsibility to make them known. If there should be an error in this judgement, you are called on, dear reader, to correct it.